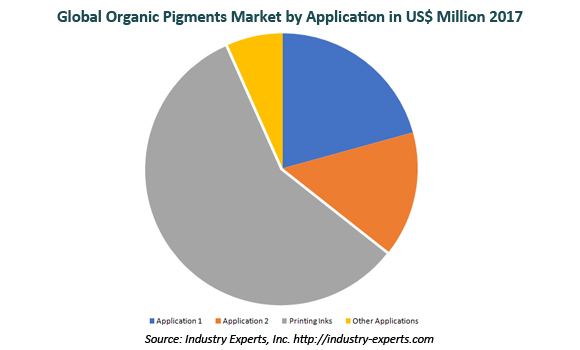 Industry Experts, Inc. unveiled the new global market report entitled “Organic Pigments – A Global Market Overview“. As per the new report, Asia–Pacific is estimated the largest consumer of organic pigments with consumption worth US$2.5 billion in 2017. This region is also expected the fastest growing market with a CAGR of 5.1% between 2017 and 2023. The use of pigments as coloring agents has a centuries old history and their manufacture had employed natural, as well as synthetic materials. Pigments are further categorized as organic and inorganic, with organic pigments being based on carbon chains and carbon rings. These substances comprise molecules made up of carbon atoms in combination with hydrogen, nitrogen or oxygen. Organic pigments may also be incorporated with metallic (inorganic) elements for helping in stabilizing the properties of the organic component. Analysts at Industry Experts, Inc. reveal that the type Azo is the largest organic pigment with an estimated market of US$3.9 billion in 2017 which is also expected to grow at a fastest CAGR of 4.7% between 2017 and 2023 while Printing Inks is estimated the largest consumer of organic pigments that is forecast to be US$4.4 billion in 2018. The report reviews, analyses and projects the Organics Pigments market for the period 2014-2023 globally, and the regional markets including North America, Europe, Asia-Pacific, South America and Rest of World. Global markets for organic pigment types analyzed comprise Azo, Phthalocyanine, Quinacridone and Other Organic Pigments. The study also explores the major applications of organic pigments including Paints & Coatings, Plastics, Printing Inks and Other Applications. The worldwide Organic Pigments market is segmented into five major regions namely, North America, Europe, Asia-Pacific, South America and Rest of World. The regional markets further analyzed for 15 independent countries across North America – The United States, Canada and Mexico; Europe – France, Germany, Italy, Russia, Spain and The United Kingdom; Asia-Pacific – China, India, Japan and South Korea; and South America – Argentina and Brazil. The analyzes the Organic Pigments market in the above regions by major country, product type and key applications. This 386 page global market report includes 217 charts (includes a data table and graphical representation for each chart), supported with a meaningful and easy to understand graphical presentation, of the market. The statistical tables represent the data for the global market by geographic region, product type and major application. This report profiles 12 key global players and 49 major players across the North America – 8; Europe – 18; and Asia-Pacific – 23. The report also provides the listing of the companies engaged in the manufacturing and supply of organic pigments. The global list of companies covers addresses, contact numbers and the website addresses of 204 companies.